The first Saturday in May is just like any other Saturday. Except for the fact that you can go to your local comic shop and get some free comics! This year was my first time partaking in what will be an annual event for J and myself. There were a couple things we learned from our experience that will help us have an even better experience next year. Don’t get me wrong, we had a blast today. We got some great comics and met some great people. 1.Go to freecomicbookday.com: Check to see if your local comic book shop even participates in Free Comic Book Day. The worst thing would be to show up at your local shop on FCBD only to find out they don’t participate. The FCBD website also has a list of what comics your shop should have. 2.Get to the shop early: There will be lines and you don’t want to find yourself at the end of the line, especially if there’s a specific comic you want. 3.Bring water and snacks: This is very important if you have your child with you and you end up towards the end of the line. You may have a 2-3 hour wait before you even see the door to your shop. 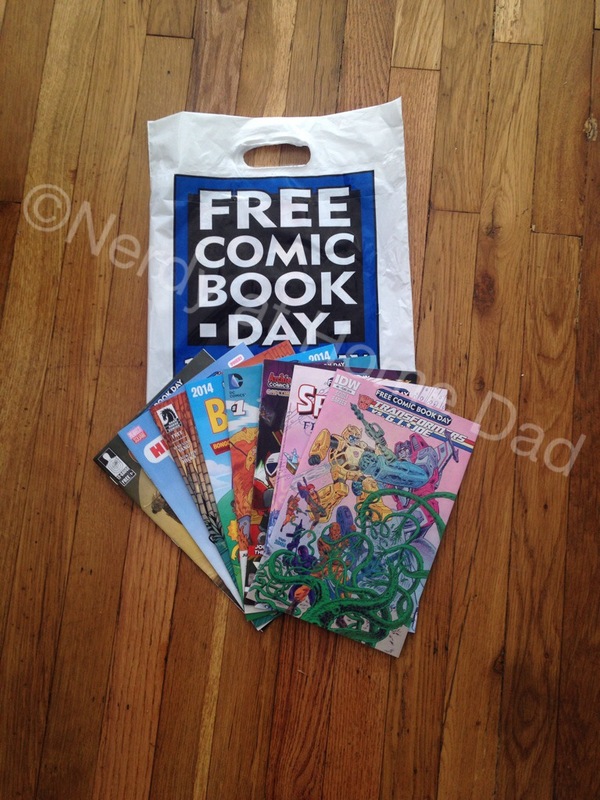 4.Bring some money: Yes it is Free Comic Book Day, but it’s not only about getting free comics. Some shops might have sales going on as well. Also it’s nice to support your local shop and economy. 5.Have Fun: The most important tip I can give with these types of events is to have fun. Your shop maybe doing more than just giving out free comics. Some shops will have cosplayers, artist/writer signings, and take and post pictures to Twitter using the FCBD hashtag to share your families FCBD experience. ***Bonus Tip*** Make it a cosplay* day: Do some family cosplay and have a great time. After getting your books, head out to a restaurant in your outfits. Make it a whole day where the family is just having a blast being their favorite comic book characters. If you didn’t make it out to your local shop this year, make sure you mark Free Comic Book Day on your calendar for next year. It’s not hard to remember since it is always the first Saturday in May. Just remember to be prepared and to have fun, and I promise it will be a great family outing.